This morning I awoke to my first cloudy sky. Although clouds line the horizon, the sky above is blue. The fine weather is holding steady. At 0815 three launches were deployed to continue surveying the deep water, central part of the channel. I watched them head out into open water, but today I am in the survey room observing the Survey Technicians (ST) as they process the multibeam sonar data. 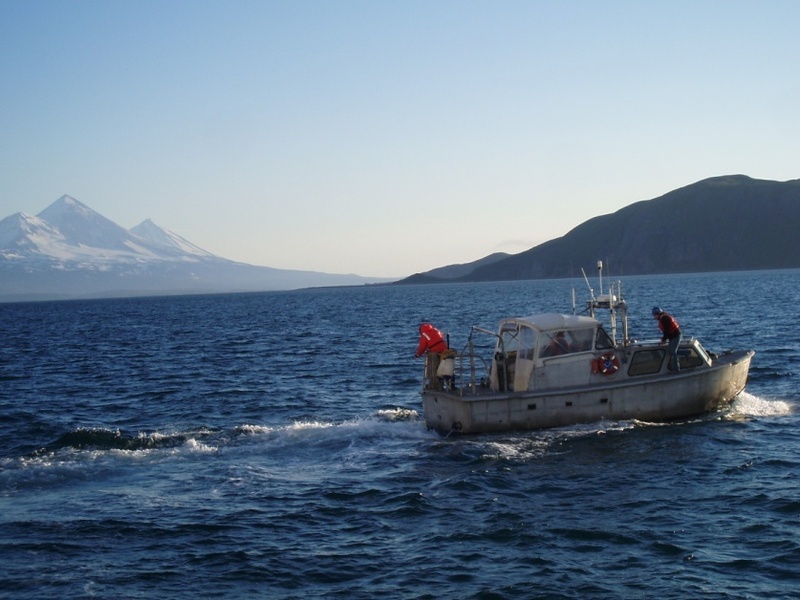 At the same time, the ship is underway to a new anchorage on the other side of the end of the world, or more properly, the other side of Inner Iliasik Island. After a full week I have a new perspective on this island and volcano world. I’ve learned the names of our islands, Inner Iliasik and Iliasik. From the launch I am able to orient myself by looking out at the islands, not just by looking at the map. I continue to learn more about navigation charts. Whenever I stop by the Bridge someone points out something new. Today I learned that this area was previously mapped during surveys from 1900 – 1939 and 1940 – 1969. That means that much of it was surveyed with single beam sonar just after World War II. It took twenty summer seasons to cover this area using single beam sonar. Using modern, multi-beam sonar, NOAA Ship Rainier is the first ship to chart this area, and the survey should be completed by 2009, or less than two years from start of survey to final chart. 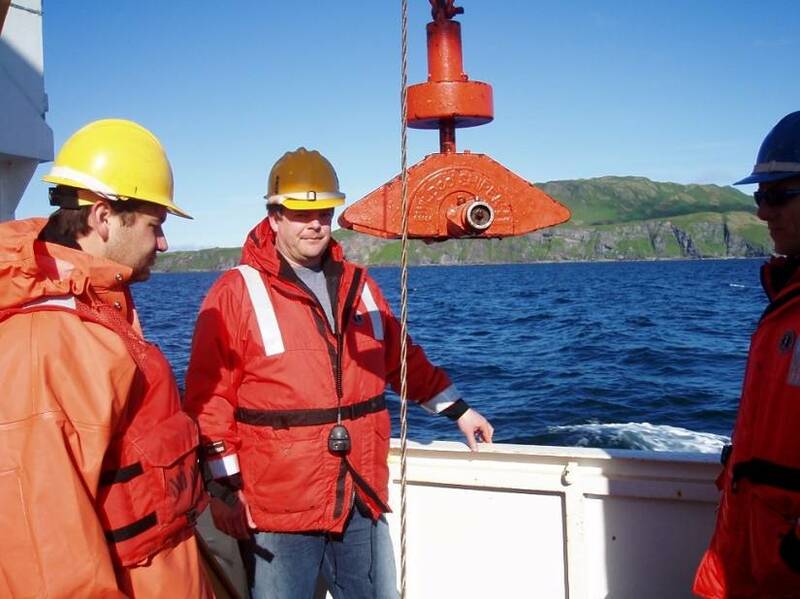 As the ship transits to its new anchorage we are collecting bottom samples at specified locations along the way. 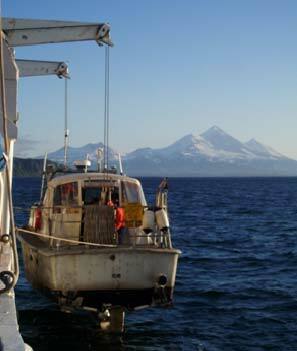 To collect a sample, the ship stops and is maneuvered into position, so the sampler can be safely lowered. A metal container descends on a cable to the seafloor. When it hits bottom a spring loaded scoop closes and collects a bottom sample. The container is winched back to the surface, and the water drained out. Then, we open it up to see what’s inside. Today our samples have been turning up broken shells, sand and shells, pebbles and shells and sticky green mud. After the samples are logged they go right back into the sea. I collected some sand samples to dry out and examine under microscopes with students. Bottom samples are used to investigate and confirm comments on the existing navigation chart. Examples of chart comments would be sandy, shells (s, sh), black sand (bk s), shoals, rocky, and my personal favorite, smoking volcano. Sample locations are selected to provide representative coverage of the areas that have been mapped, and the data will be used to update the charts. Soon this sample data along with reflectivity data (measured as changes in backscatter of the sound pulse that reflect the hardness of the bottom surface) from the surveys will be used to map the type of seafloor along with the shape of the seafloor. This would be similar to generating a preliminary geologic map of the seafloor. Tomorrow I expect to be back on a launch with a better understanding what goes in to compiling a navigational chart. Dinner is at 1700 (5:00 pm) prompt. After dinner people pursue their own activities. Some fish from the fantail. 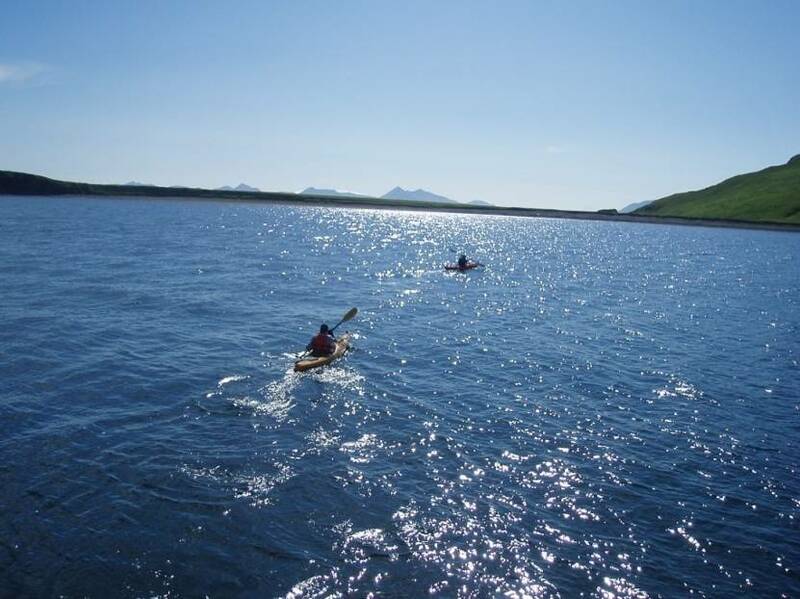 If the weather is calm, the smaller launches are used by fishing parties, and sea kayakers venture out to the islands to explore and hike. As I enjoyed the bright, warm sunlight on the fantail deck, I watched the progress of the hikers, tiny dots progressing steadily up the slope of Inner Iliasik Island. I gazed past the islands at the distant, hazy volcanoes, and spotted an ashy plume! With binoculars it was possible to see that smoke was rising from a small crater atop a conical volcano. Several of us rushed to the bridge to identify the volcano by locating it on the nautical chart. Our best guess, Dutton, which was not listed as presently erupting on the Alaskan Volcano website, http://www.avo.alaska.edu . Volcano watching is an exciting after dinner activity. 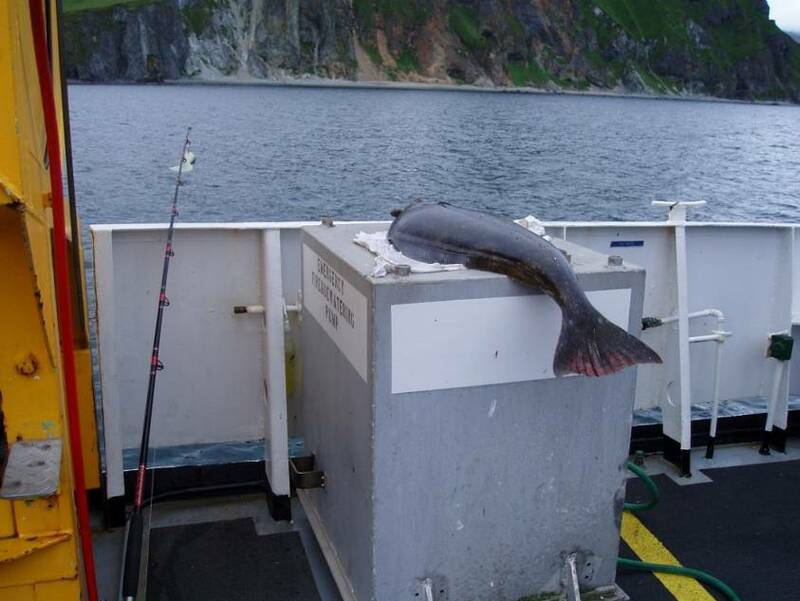 This entry was posted in 2008, Lisa Hjelm, NOAA Ocean Service, NOAA Teacher at Sea and tagged Alaska, CTD, Hydrographic survey, launch, multibeam sonar, navigational chart, noaa ship rainier, pavlov islands. Bookmark the permalink.